From Geo to Neo: Can NeoCities Provide a Creative Utopia for Contemporary Web Culture? Established in 1994, one of the most popular websites worldwide by 1997, and bought by Yahoo! For $3.57bn in 1999, the US branch of GeoCities closed in 2009. Hailed as a structural precursor to the socially centred web as we know it today, the decline of GeoCities has led to archival art projects such as Ryder Ripps’ Internet Archaeology, and Olia Lialina and Dragan Espenschied’s One Terabyte of Kilobyte Age. Another result of GeoCities’ closure is NeoCities. A start-up fronted by Kyle Drake, NeoCities is concerned less with early vernacular web aesthetics, and more with challenging the ‘boring, suburban gated communities’ of contemporary social networking. Olia Lialina notes her paradoxical relationship with the closure of GeoCities: ‘On the one hand, the shutting down of GeoCities was no doubt a barbaric act. On the other hand, all the buzz it created and the fact that GeoCities was eventually rescued and archived has created this research opportunity’. This emotional dichotomy is surely also relevant for the founding of NeoCities, provoking questions regarding the type of online space NeoCities exists within, its comparative relevance to the blogging practices of web 2.0, and the personal consequences of existing online. I want to make another Geocities. Free web hosting, static HTML only, 10MB limit, anonymous, uncensored. Although drawing influence from Web 1.0, and fuelled by a desire to combat design and content tropes of current social networking sites, NeoCities is undeniably a symptom of Web 2.0. Despite his criticism of templated self-expression, Kyle Drake uses Twitter to gather interest in his project, and NeoCities is reliant on crowd funding to stay online. NeoCities seems to exist in limbo between the neighbourhood-based communities of GeoCities in its idealised stage, and the follow/friend system used by most current social media. The structure of NeoCities is solipsistic; at the time of writing the site has no features allowing users to interact with each other through the dashboard system, and there is no other community present except for NeoCities itself. Indeed, Lialina criticised the site for calling itself NeoCities without including the obligatory ‘cities’ of its namesake. Common contemporary features of social networking may be missing for a reason. The purpose of NeoCities seems to be a fight against aggregation of homogenous information and reblog culture. In the first NeoCities blog post, Drake describes the web today as a ‘sad, pathetic, consumption-oriented digital iron curtain’; while he does not explicitly name any websites, Drake’s vitriol seems to be politically directed at sites that could be viewed as gentrifying online space. So by not providing the same social services as these sites, NeoCities becomes part of the solution rather than part of the problem. 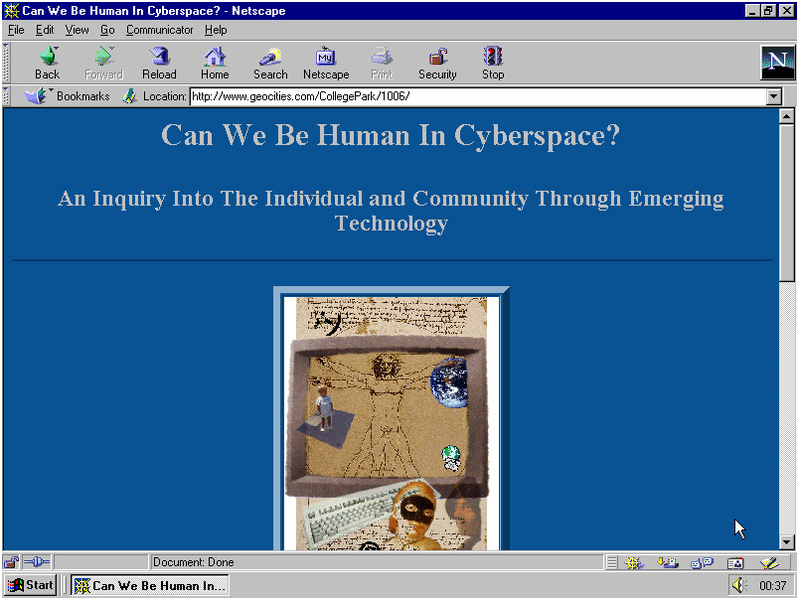 Both GeoCities’ and NeoCities’ concepts can be traced back to the prominent theories on cyberspace from which GeoCities is presumably developed: ‘Cyberspace consists of transactions, relationships, and thought itself, arrayed like a standing wave in the web of our communications. Ours is a world that is both everywhere and nowhere, but it is not where bodies live.’ (Barlow, 1996: p. 1). Former concepts of property, expression, identity, movement and context do not apply to cyberspace, where there is no matter or system. One enters a digital body of online identity: ‘Even the individual self, so long trapped in the human body, would finally be free to step outside its fleshy confines, explore its authentic interests, and find others with whom it might achieve communion.’ (Turner 2008: p. 1). The concept of NeoCities, a space of creative freedom and independent Internet, can be defined using the alternative space model. According to Foucault there are two types of dissenting spaces: utopias and heterotopias. ‘Utopias are unreal places that have a general relation of direct or inverted analogy with the real place of Society. They present society itself in a perfected form, or else society turned upside down’ (Foucault 1986: p. 24). Heterotopias are real places, formed in the founding of society as counter-sites, different from all the sites that they reflect and speak about: ‘An enacted utopia in which the real sites are simultaneously represented, contested, and inverted’ (Foucault 1986: p. 24). GeoCities worked within the utopian definition, whereas NeoCities better suits the heterotopian definition. GeoCities was, at first, a perfect utopia, being an unreal place with no physical space within society, and having no relation to existing places with the same moral and aesthetic structure. It tried to create an ideal society, with differing norms; it was like society turned upside down. NeoCities can be seen as a heterotopia, although it is not an existing physical place in society either. Nowadays, the Internet is more like a full society in itself, and NeoCities is the counter-site within that ecology. Its ideal was formed in the founding of Internet-society, and differs from current prominent social networking sites. It is a non-hegemonic space of otherness that has relationship to other places, through its promotion use of social canals such as Twitter and BitCoin. NeoCities cannot exist without the support of other facets of online culture, and thus can never be the creative utopia that Kyle Drake may have hoped for.